Sephardic Shul As shouts of mabrouk joined those of mazel tov during a Chabad celebration, Rabbis Goodman and Carlebach wondered if they were meeting the needs of their Sephardic students. They began to reach out to Sephardic-Syrian students by providing special learning opportunities, shabbatonim, and a room for separate services. Mr. Hecht explains that Sephardic-Syrian students are attending universities in greater numbers than any other previous generation. Their families are, of course, concerned about their ability to thrive not only academically but also spiritually in a comfortable environment. As soon as Rabbi Carlebach shared his dream for constructing a new Syrian sanctuary, Mr. Hecht assumed a lead development role, raising funds for prayer books and a Sephardic Torah scroll. Community leaders are thrilled that Rutgers is establishing the first Sephardic-Syrian shul on any university campus in this country. Mr. Harry Franco, Mayor of Deal, New Jersey, and a long-time supporter of Chabad House, is ecstatic about the planned Sephardic synagogue. “Rutgers University is already a magnet for students from the Sephardic community of Deal. The new shul is welcome news for the entire Sephardic community in Deal,” says Mayor Franco. Clearly the shul will provide a place for daily prayers in familiar Sephardi nusach, as well as a comfortable home for Sephardic students who stay in school for Shabbat. Jeannie Epstein along with her husband Donald is a Deal resident and Chabad House supporter. When she learned about the plans to build a Sephardic-Syrian Synagogue, Jeannie was both amazed and appreciative. “Despite the large number of Sephardic students at Rutgers, many,” she says, “miss their connection to traditions while on campus.” She believes that the new shul will encourage many more students to chose Rutgers. 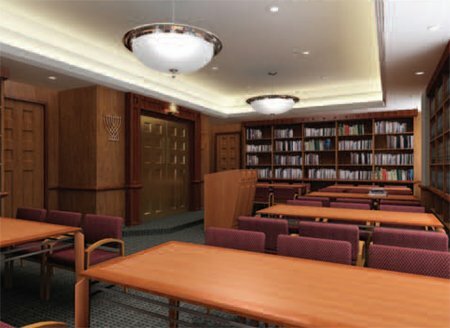 Name dedication opportunities specifically related to the Sephardic shul are still available. These include naming the synagogue, dedicating the Sefer Torah, Bima, Heichal, and more. To secure your dedication, please contact Rabbi Yosef Carlebach at rabbi@chabadnj.org or at 732-296-1800.